We love to share our adventures in the southwest and northeast. Fly in on a Wednesday night. If you come from the east coast like us, you'll arrive starving. Forget the idea that you'll be tired when you arrive; you won't be when you pick up your bags and feel that southwest night air. You'll be wide awake by the time you see the lights of the strip. We always stay near NYNY so our first stop is there. Go grab some late night dinner (or breakfast) at America's in NYNY Casino. We love this place. There's an amazing 3D map of the United States to look at as you marvel at the fact that "I'm in Vegas!" They have breakfast all day, a late night menu, gluten free options, and delicious desserts. After a good meal, walk right over to the piano bar. Wednesday nights are quiet so sit down and relax at the bar slots, throw in a $20, and have a drink or two. 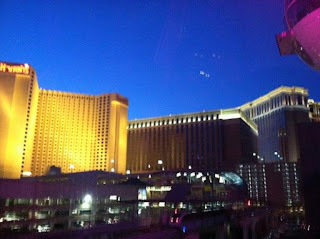 When I first starting vacationing in Vegas with my husband, we were both eating whatever and wherever we wanted. Then, 6 years ago, I was told I have an allergy to wheat and my only option was a gluten free diet. Here are my favorite, inexpensive places to eat which are also approved by my gluten-loving husband. Craving at the Mirage mirage.com is a buffet we have enjoyed pre and post gluten diagnosis. This is your health so speak up and ask the host or one of the cooks to speak to a chef about what is gluten free and what is not. The chef will give you a quick tour which is very helpful. Don't be shy about this. You don't want to be sick on vacation! Italian Display - Don't bother. I have yet to find gluten free pasta or pizza at a buffet in Vegas. Mexican - Ask and be sure they are corn chips, not flour. Also ask if the meat is seasoned. Salad bar - yes, just be careful with the dressings. Be sure to ask the chef during your tour. Breakfast omelettes made to order - yes! Sandwich area - yes! They do offer gluten free bread and a designated toaster! Surprising, I know! While my husband indulges in the variety of cookies, cakes, brownies, etc. I can have a dessert too. There are gluten free desserts here! Every time we have visited this buffet, there is at least one dessert labeled gluten free. Typically it is a pastry of some kind and I am not a pastry lover, but it's nice to know there's the option. Honestly, I am usually full by the time we get to dessert. Besides food, the buffet offers endless soft drinks, juices, tea, and coffee. Money Tip: Try saving some money and purchase a 2 for 1 Buffet using the myvegas app. This is at an Mlife property so you can charge this to your room. Also, you will gain points by eating at an Mlife restaurant so do not throw away your receipt. If you are not an MLife member, find the MLife desk before eating at the buffet and ask for a player's card. It's free. The Aria buffet is expensive. There are gluten free options and more seafood options than Cravings. However, since I am from the east coast and have plenty of good seafood at home, I prefer Cravings. I like the price and the atmosphere at Cravings better. Since the Aria and Mirage are both MGM properties don't be surprised when you see many of the same exact offerings. Reminder: This is at an Mlife property so you can charge this to your room. Also, you will gain points by eating at an Mlife restaurant so do not throw away your receipt. The buffet compromise between me and my husband is good for one meal only. So, where else do we eat gluten free? I love, love, love a good deal and just because I have a diet restriction doesn't mean I have to spend a lot of money so why not jump on the happy hour train. All Aboard! Our favorite happy hour is at El Segundo's at the Fashion Show Mall. I don't think we have gone to the Fashion Show Mall for shopping, ever. It's all about the food. Unlike many happy hours on the strip, this happy hour is 7 days a week. From 4pm-7pm you can get great deals on drinks and food. The menu consists of tacos, quesadillas, chips and drinks on the happy hour includes beer, sangria, margaritas, well drinks, shots. Try the red sangria - awesome. There's homemade guacamole and different types of salsas which are perfect for a bar snack. There are two bars here and never over crowded. The bartenders are friendly and the managers bring out our gluten free plates. Awesome! Way on the other end of the strip is our other favorite happy hour. This favorite happy hour is upstairs in the Luxor at Tacos and Tequilla. This happy hour is 2-5pm Monday-Friday. My husband's favorite is the wings and I get the nachos with steak. Delicious. The drinks are amazing too. Again, this is a fun atmosphere bar with wonderfully friendly bar tenders and never really crowded. Since this is upstairs, you are away from the ding-ding-ding of the casino yet close enough you won't have to walk far to join in any of the action. Actually, you're just an escalator ride away. Tip: This is at a Mlife property so you can charge this to your room. Also, you will gain points by eating at a Mlife restaurant so do not throw away your receipt. Disclaimer: These are my thoughts and opinions. Please remember this is my experience with food and my allergy. If you have an allergy, you should always check with the restaurant before eating there. Slot players love bonuses! Here's a list of 5 games we love to play just based on the bonus games. Having fun while winning money is the name of the game. 1. Simpsons Slot Machine: Double seater (already a plus), three screen slot machine with a variety of bonuses. There's a random monorail bonus, donut bonus, and bonus based on your favorite character appearing in all four corners of the game. This is a colorful and noisy machine. Plus, what could be more fun than hearing Homer antagonizing the player to hit the button and making the infamous "Doh". I am afraid of heights. Really afraid. I just don't like to be up high and I certainly don't like to look down and yet one of my most talked about adventures in Las Vegas is when my husband and I rode the tallest ferris wheel. Usually, if my kids and husband convince me to ride a roller coaster after constant nagging and sweet talking, it's a miracle and they have to promise not to laugh at me. A couple of years ago they convinced me to ride the Disney Snow White roller coaster and I insisted on sitting with my little girl so I could hold her hand. In reality, I knew she would hold my hand! Call it wimpy, call it smart but in truth it takes a lot to get my feet to leave the ground. Camping is a fantastic way to vacation. I have been camping with my children since my boys were 2 and 3 years old. I started camping in 2006 as a single mom with two, very active boys and a dog. I was stressed, overwhelmed, and struggling to find a way to relax on a vacation with a budget when someone suggested I try camping. I borrowed a tent, packed up food and the basics and I experienced my first camping weekend. Over the years, camping has changed for me; I camp with a camper and I am a happy wife with three kids and two are teens. What has not changed is the feeling I get on that first camping night when the food is put away, the kid's bikes are out of the truck, and my worries consist of thoughts about finding enough logs and sticks to keep the fire going for those yummy s'mores. Yup, that’s what happened and Vegas style! 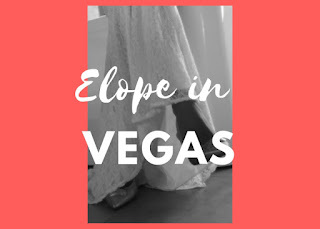 If you’ve ever considered tying the knot in Sin City, but you heard it would be unmemorable or even, dare I say, cheesy, you should keep reading. We had the most amazing time getting married in Vegas! Coming from Massachusetts, my husband and I planned ahead for the license, hair, limo but then other parts we just let the chips fly where they may.I hope our experience helps others. My husband and I enjoy our adventures together, solo, and with our children. The hikes and experiences shared in this blog are based in the northeast and southwest.